Welcoming Spring and Gearing Up for the 2014 Season! 85 % of you are women – though the men that have come out have been big fans! 99% of you like photos of yourself doing yoga outdoors – as evidenced by your re-posts on Facebook and Twitter! 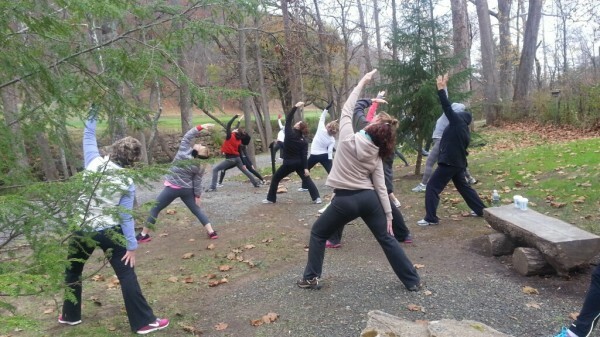 78 people participated in this Yoga Hike at The Greenbrier in West Virginia! In the meantime, I look forward to reconnecting with many of you via Facebook, Twitter, and Instagram. If you have ideas or feedback for this season, PLEASE don’t hesitate to reach out and let me know. 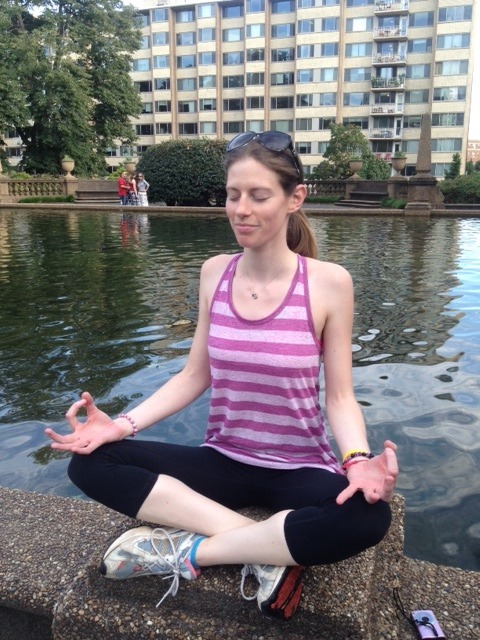 Also, if you are interested in organizing a special outdoor yoga event or a private group Yoga Hike for friends, colleagues, or family, you can always contact me at danielle@yogahikesdc.com Happy Spring, everyone! Hiking back to the start! Thank you to blogger Mar on the Run for sharing her yoga hike experience in this fantastic post! Please check out her blog for more! Posted by Mar on the Run! About a week ago a photo popped up in my Facebook news feed. 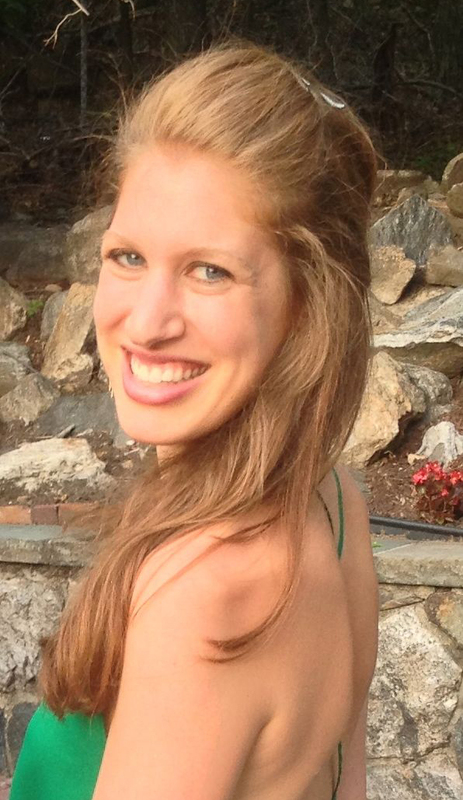 It was of Danielle Reyes, the owner and operator of Yoga Hikes DC and she was enjoying an off day hiking. 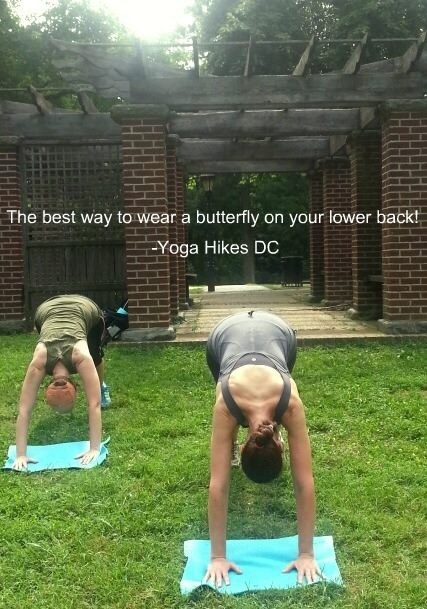 Seeing the name “Yoga Hikes DC” I was intrigued about this combo so I clicked on the Facebook page to learn a little more. What I read interested me enough to sign up for a class this past weekend. As a runner I truly believe that in order to be more effective at it and reduce susceptibility to injury, you need to engage in other fitness activities. I complement my running with strength training, cross training and on occasion – yoga. Admittedly, yoga is one of those activities that I enjoy once I manage to actually get to a class. My problem is I like to sweat and move and sometimes the slow meditative state of the practice doesn’t interest or motivate me enough to get to a class consistently, no matter how good for me I know it is. 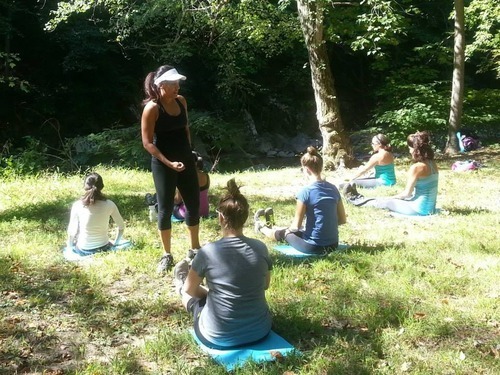 In comes Yoga Hikes DC which offers 90 minute sessions of moderate hiking interspersed with Yoga practice, generally alternating between the two every 15 minutes. Yoga and hiking in the same sentence? That line alone had me very excited!! A small group of us met up with Danielle at noon on Saturday at the entrance of Rock Creek Park near Calvert Street/Woodley Park. Our route took us through the trails of Rock Creek Park along the water, out and back to Dumbarton Oaks Park, up a hill towards Montrose Park and a final descent and hill climb to where we started. Even after being in DC for many years I have not ventured into these trails enough. It is simply gorgeous back there! We started at the opening of the park for a nice warm up, breathing exercises and some downward and upward dog practice. Don’t worry about carrying a mat (or even bug spray, which you’ll need! ), Danielle’s got it all in her backpack. We were encouraged to simply enjoy and take in the nature and sounds around us. Be forewarned though, if you are not into the elements or swatting away bugs this may not be for you! It is truly a ‘nature’ hike! Time seemed to move really quickly during our session as we moved between yoga practice and hiking. When we were in the hiking part of the session we were instructed to walk briskly and swing our arms to push through the terrain. We stopped along the water to unleash our inner warrior with a sequence of poses along with upward and downward dog, planks and stretches (followed by a little hand dip in the water!) climbed a hill (or two) and practiced “Tree Top” by what else? a big tree. 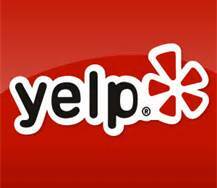 Danielle has the routes carefully mapped out and timed and I cannot think of a better way to get the best of both worlds in fitness and enjoy the outdoors. She talked about adding different types of hiking/yoga adventures to the fold in the future but this is great for all fitness levels. I truly enjoyed this class and am loving the concept. I will definitely be back again!! You can view more pictures of our Saturday adventure here on the Yoga Hikes DC Facebook page – and give it a “like” while you’re at it! 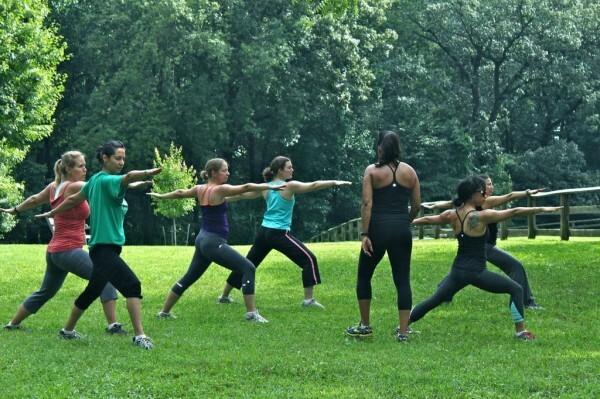 The new fitness program leads a hike through DC and Rock Creek Park interspersed with mini yoga sessions. Danielle Reyes leads a small group of hikers through a 15-minute yoga session in Montrose Park. 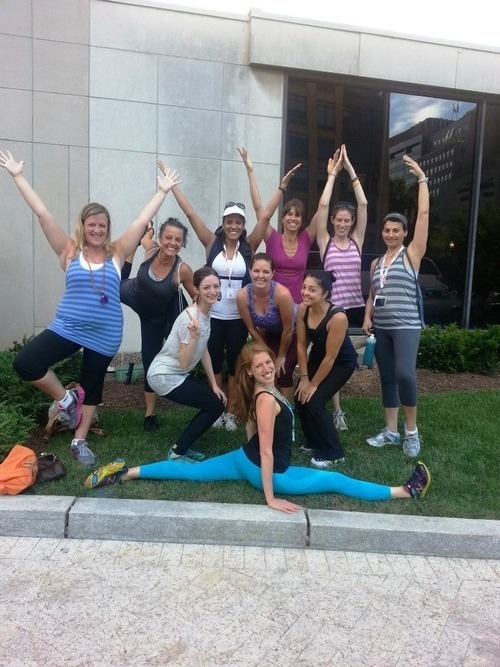 It’s all part of the new program Yoga Hikes DC. Photographs by Melissa Romero. Washingtonians are such a fitness-loving bunch that hybrid exercise classes have become the norm. Barre and cycling? Been there. Yoga and Pilates (a.k.a. Yogalates)? Done that. 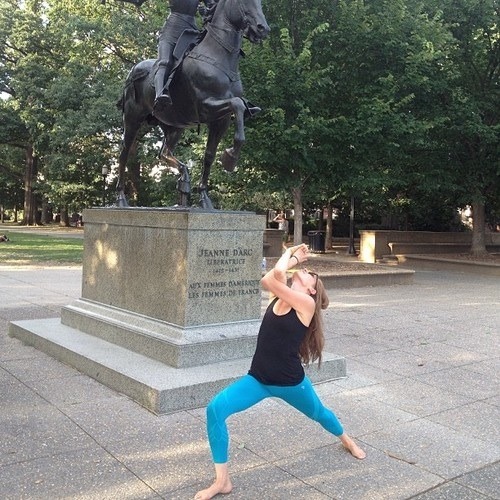 I thought I’d seen all the city had to offer, until I stumbled upon the new program Yoga Hikes DC. 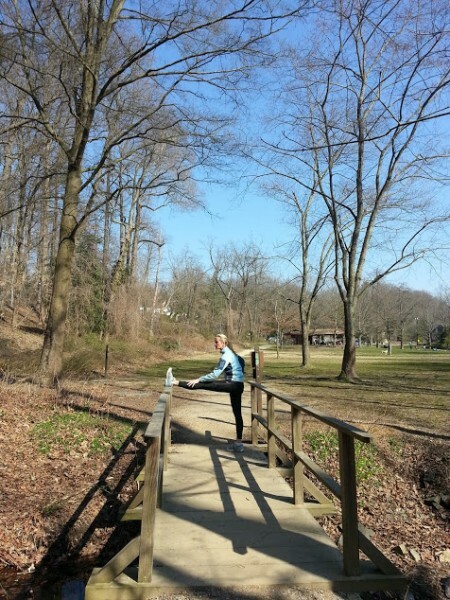 For the past three weeks, those who frequent Rock Creek Park may have come across a small group of yogis practicing their tree pose or Warrior II at the foot of the creek. Or maybe they’ve drawn stares in Dumbarton Oaks as they stop for a quick Downward Dog before setting out once more on one of the many winding trails. 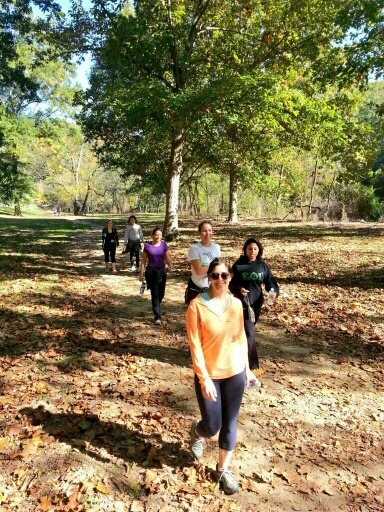 On Saturday morning I joined Reyes and a group of six women for a yoga hike through Rock Creek Park, Dumbarton Oaks, and Montrose Park. Reyes carried all the supplies we’d need—sunscreen, bug spray, mini yoga mats—in a backpack and led us to the start of a trail below Calvert Street. After a few downward dogs and some bug scares (expect to find a few critters crawling around), we headed into the woods to begin the brisk hike. This is no leisurely hike—Reyes has each route mapped and timed so that the group reaches each yoga spot on schedule. But each 15-minute session flew by, as we did Warrior II poses under the searing sun at the bank of the creek, and as we hiked through the public portion of Dumbarton Oaks, where many of us exclaimed in wonder over the 27 acres of land. After climbing one big hill—each hike includes at least one—Reyes led us through our last yoga session in Montrose Park, where we fittingly did tree poses while gazing up at a giant tree. But just as soon as we handed our mats back to Reyes, we were off again to finish the hike back to trailhead. 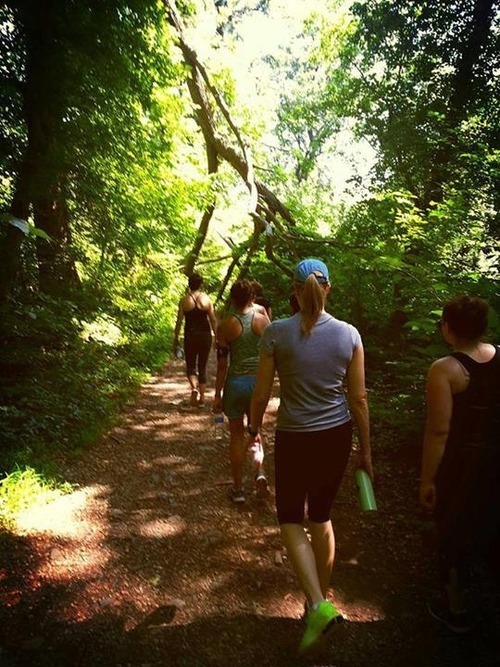 Yoga Hikes DC is $25 for drop-ins. Enter the code FFSPRING at checkout to receive a 20 percent discount. 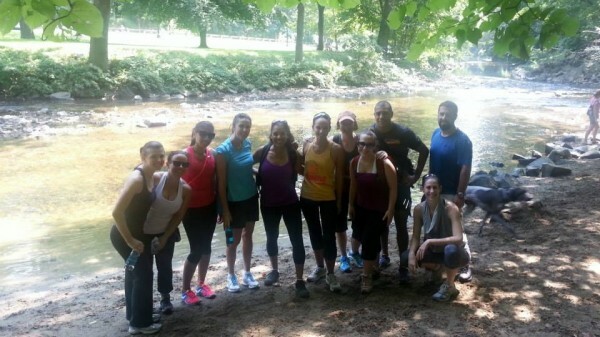 Reyes leads four to five hikes each week beginning in Dupont Circle and Rock Creek Park.